The bar set looks great in my small kitchen. The chairs fit under it nicely. The height is perfect. However I did have one problem— putting it together. That was rough, but it was worth it. I do not recommend this product for heavy people. I do not think they would find it comfortable. Create the charm of bistro dining in your kitchen area or breakfast nook with this Vandeventer 3-piece dining set from Porch & Den. The black finish set includes a tall, metal table with a round top and a pedestal X-base, and two bar stools. 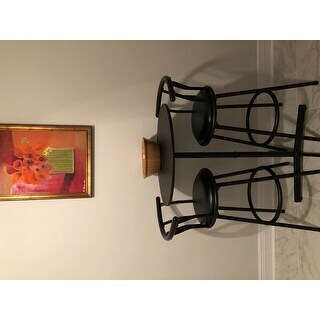 Each stool features a round seat, upholstered in faux black leather, and a short contoured back with on open rail design that completes the quaint sophistication of this lovely set. Works great in my kitchen! The construction was a little tricky but not overly time consuming & the Allen Wrenches needed for the job are included. The table is a good size for 2 people & if it wobbles on your floor the base has little pegs you can adjust to even it right up. I'm really happy with this purchase, nice value for the price! I love my new kitchen set. Goes great with the theme. Not good. The table is extremely flimsy and cheap. You cannot even enjoy a cup of coffee at that table, it will spill everywhere. I purchased it because of the dimensions, which fit perfectly in my small kitchen space. So, it looks good...but it is not functional. You can only tighten it so much...it's just not a quality product. The only reason I gave it 2-stars is because it looks good...very modern &amp; sleek. You get what you pay for. I got this for our ping pong room, we were limited on space and this table and chairs fits perfectly in the corner. It was easy to put together and the chairs are comfortable, and it’s nice and solid, my husband loves it. Table with single leg would not tighten and fell apart just days after assembly. I would NOT recommend this product to anyone! The holes for the screws do not line up.It takes 2 people to hold the screw hole in place and another to screw the screw in place - a most difficult task. I would NOT recommend this product unless you have immeasurable patience and a lot of time. Rusted, crooked, missing parts, unstable, garbage! This is my first order here and will probably be my last based on how bad the quality is and what a hassle the return is. Table sits crooked and wobbles like crazy. If you are overweight, not for you, but very nice otherwise! These were purchased for our break room - we wanted a sheek look for our break room, something that would be relaxing and look awesome. I was looking for something to teach my online classes from so that I could sit up a little higher. "How much weight can the barstools hold"